Official 7″ Raspberry Pi Screen Case #3DPrinting #3DThursday « Adafruit Industries – Makers, hackers, artists, designers and engineers! Jap_MK2 shared this project on Thingiverse! 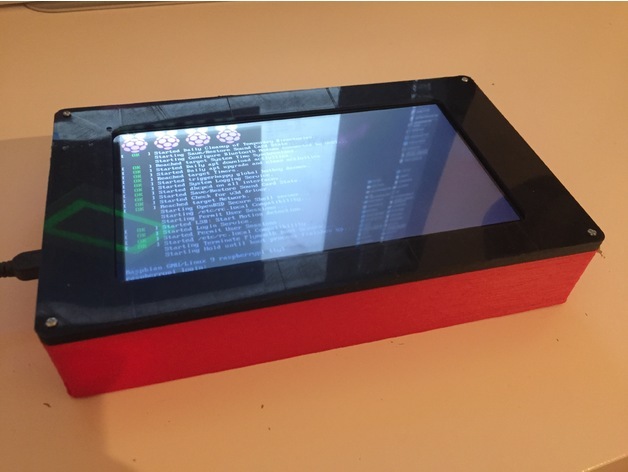 A case or enclosure for the official Raspberry Pi 7″ screen with display and GPIO access. You need the ribbon/extension cable for the GPIOs to attach it at the right side of the case. There you have the access to the GPIOs, but without any marks, so you gotta remember which way round you inserted it. You also need to solder the GND and 5V VCC cables for the screen on the downside of the GPIOs to still be able to attach the ribbon/extension cable for GPIOs. But this should not be an issue, it still worked out pretty well.